The German socialist Eduard Bernstein was a leader of the revisionist, or evolutionary, wing of the German Social Democratic party. Eduard Bernstein was born in Berlin on Jan. 6, 1850. As the family's financial resources were limited, his educational opportunities were restricted, and at 16 he became an apprentice in a bank. Within a few years he had risen to the position of bank clerk. 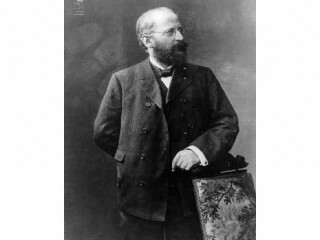 In 1872 he joined the Social Democratic party (SPD) and became an active member of the party's Berlin organization. In 1878, shortly prior to the adoption of Chancellor Bismarck's antisocialist legislation, Bernstein traveled to Switzerland. As a consequence of Bismarck's continued hostility toward the socialists, Bernstein remained in Switzerland and became the editor of the official SPD newspaper. After Bismarck brought pressure to bear in order to halt the smuggling of the newspaper into Germany, the Swiss government forced Bernstein to leave in 1880. He then went to London, where he met the German socialist Friedrich Engels, eventually becoming one of his close associates. Bernstein was also able to study the British labor movement and associate with the recently organized Fabian Society, an organization of socialists. Early Fabians such as George Bernard Shaw and Sidney and Beatrice Webb rejected revolutionary Marxism and advocated what they termed "the inevitability of gradualness." This idea was to form a central part of Bernstein's mature "revisionist" position. During the 1890s Bernstein began to make his break with orthodox Marxism clear. His revisionist position emerged in a series of articles in an official party publication, Die neue Zeit, in 1898. The reaction to these articles by groups within the SPD caused him to write a defense, Evolutionary Socialism (1899). In this classic statement of the revisionist position, Bernstein used scientific analysis to attack the premises of revolutionary Marxism. He demonstrated through statistics that workers were not becoming more impoverished and that capitalism was not becoming less stable and thus its collapse was not imminent. He rejected revolutionary tactics as self-defeating and advocated achieving reforms through moderate and constitutional methods. He also urged that the SPD, a working-class party, should attempt to win over the middle classes. Revisionism was officially condemned by the SPD in 1903, and the polarization of the party's revolutionary and evolutionary wings existed until after World War II. By his death in 1932 Bernstein had long since ceased to be regarded as a leader or major theorist of the SPD. But when the party was reorganized in West Germany after World War II, many of Bernstein's ideas were incorporated in its programs. The new party gave up its revolutionary theory, emphasized action and reform, and attempted to broaden its political base by cutting across ideological and class lines. Bernstein's major work, Evolutionary Socialism! A Criticism and Affirmation, is available in a good translation by Edith C. Harvey, with an excellent introduction by Sidney Hook (1961). The best study in English of Bernstein's life and work is Peter Gay, The Dilemma of Democratic Socialism: Eduard Bernstein's Challenge to Marx (1952). For background see George Lichtheim, Marxism: An Historical and Critical Study (1961; 2d ed. 1964). View the full website biography of Eduard Bernstein.